Ear Candling is an age-old practice that is believed to have a rejuvenating effect on the overall well-being of a person by creating harmony of the body, mind and spirit. The practice of ear candling technique dates back 2,500 years and the ancient Egyptians, Tibetans, Chinese and American Indians are credited for developing this practice of alternative medicine, which I am offering to many clients here in Vancouver, BC. 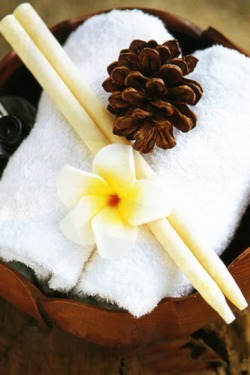 Ear Candling technique involves the use of a special hollow candle. Ear candles are made from cotton or linen and are soaked in soy or bees wax. For performing ear candling, one end of this candle is lit and the other end is placed through a hole in a specially designed plate and then in your ear canal. The plate is there to protect your head. It is a very safe and relaxing procedure. stimulating and invigorating effect on the central nervous system, mainly on the brain. Balances the pressure in the ear and purify blood. A spiritual effect that purifies the mind and opens the spiritual centers or energy points. A soothing and relaxing effect on the mind by reducing stress and tension and restoring emotional balance.